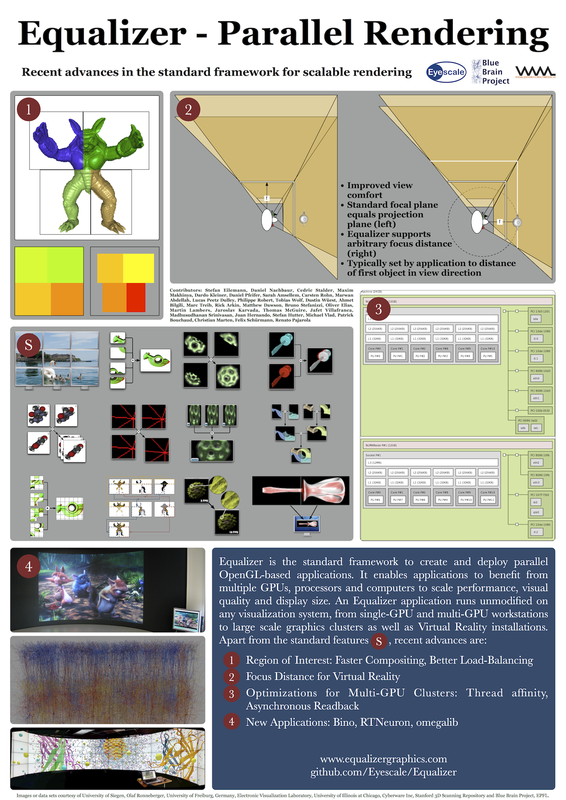 Tomorrow night is the poster session for the second poster, recent advances in Equalizer: Region of Interest, Focus Distance, Optimizations for Multi-GPU Clusters (Thread Affinity, Asynchronous Readback) and new applications. The poster is already up in Ballroom A, or on the right side. The DASH poster reception went very well, everybody I talked was convinced by the concept and saw immediate applicability for their problems. The feedback was much more positive than I was hoping for. 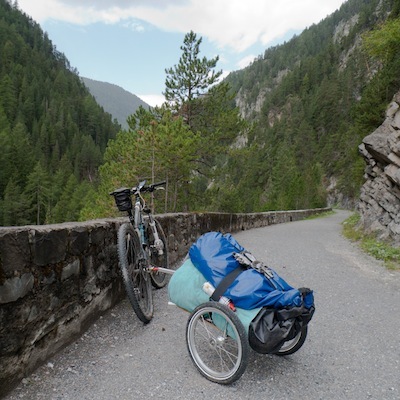 The last two weeks have been quiet, since I was on biking through Switzerland. Meanwhile, poor Daniel back at work churned through most of the Collage changes outlined in the last post. You can see the changes in the Collage endian branch on github, which will be merged back into master in the next couple of weeks. Now back to the news: After finally figuring out how to build Equalizer and dependencies using MacPorts portfiles on Mac OS X, I released the long-standing 1.4 version of Equalizer, GPU-SD, Lunchbox and vmmlib. Below is the release announcement – enjoy! Neuchatel, Switzerland – September 7, 2012 – Eyescale is pleased to announce the release of Equalizer 1.4. Equalizer is the standard framework to create and deploy parallel, scalable 3D applications. This modular release includes Collage 0.6, a cross-platform C++ library for building heterogenous, distributed applications, GPU-SD 1.4, a C++ library and daemon for the discovery and announcement of graphics processing units using zeroconf networking and Lunchbox 1.4, a C++ library for multi-threaded programming. All software packages are available for free for commercial and non-commercial use under the LGPL open source license. Equalizer 1.4 is a feature release extending the 1.0 API, introducing major new features, most notably asynchronous readbacks, region of interest and thread affinity for increased performance during scalable rendering. It culminates over seven years of development and decades of experience into a feature-rich, high-performance and mature parallel rendering framework and related high-performance C++ libraries. Equalizer enables software developers to easily build interactive and scalable visualization applications, which optimally combine multiple graphics cards, processors and computers to scale the rendering performance, visual quality and display size. Eyescale provides software consulting and development services for parallel 3D visualization software and GPU computing applications, based on the Eyescale software products or other open and closed source solutions. Please check the release notes on the Equalizer website for a comprehensive list of new features, enhancements, optimizations and bug fixes. A paperback book of the Programming and User Guide is available. We would like to thank all individuals and parties who have contributed to the development of Equalizer 1.4. Left image courtesy of Cajal Blue Brain/ / Blue Brain Project. Second from left copyright Realtime Technology AG, 2008. Right image courtesy University of Siegen, 2008. While I personally think that barriers are an anti-pattern, they have exactly one valid use case in my line of work — as swap barriers synchronizing the display of a new frame across multiple segments of a display wall or immersive installation. In an ideal work, swap synchronization would be done using hardware support. Equalizer supports this for nVidia G-Sync, but I haven’t seen many installations using hardware swap synchronization. First, it’s expensive since you need a professional grade card with a special synchronization board. So lower cost installations such as display walls typically don’t even have the hardware. 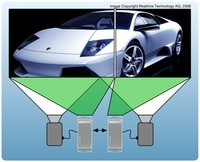 Installations which need the frame synchronization, such as active stereo setups, oftentimes only use the frame (retrace) synchronization and use a software barrier for swap synchronization. The reason is that getting hardware swap synchronization running is such a mess due to driver issues that most people don’t bother. For these reasons, Equalizer both supports hardware and software swap synchronization. The software synchronization used a co::Barrier. Back to the Collage barrier: Once it is set up, the only call needed is enter, which will block until the height has been reached. Barriers are versioned, distributed objects. Any process can set up a barrier, register it and communicate the barrier identifier and version to all users of the barrier. The users map, sync and enter the barrier. Since it’s versioned, the master instance can be committed any time, and enter requests are versioned, that is, a barrier operation for an old version will be finished before the enter requests for the new version are processed. The protocol right now is very simple, a master instance simply tracks enter requests until the height is reached and then unlocks all users. While there are other algorithms which use optimized tree structures or broadcast to reduce the latency, we haven’t seen the need to implement a more complex algorithm. I’ve just uploaded the review version of the Programming and User Guide for the upcoming 1.4 release of Equalizer, and to a certain extent, Collage. This one packs 111 pages of content (118 total) and 63 figures. In a couple of weeks I’ll create the final hardcopy version on Amazon/CreateSpace. This edition has, among the customary full review pass, a lot of new content. Starting with a full new chapter on Sequel and the associated polygonal rendering example, continuing with new section for application-specific scaling factors in immersive environments, region of interest for compositing and load-balancing and zeroconf discovery in Collage, finally finishing with a substantial rewrite of the section on distributed objects in Collage. The book is structured in two parts: The User Guide, laying the foundation on parallel rendering and scalability algorithms, and then explaining the configuration of visualization systems for Equalizer applications. The appendix contains a full reference on the file format. The second part, the Programming Guide, gradually introduces programming parallel rendering applications. Starting with the basics in eqHello, the complexity is gradually increased with a chapter on Sequel and Equalizer using the respective example application. After this, an advanced features section focuses on introducing and demonstrating on specific features in isolation. It finishes of with a chapter on the Collage network library. The Programming and User Guide is the ‘OpenGL red book’ of Equalizer. It consolidates all the documentation available in various places (Equalizer website, mailing list, github feature issues, my head) into a single document. Apart from gathering this information, through the format emerges a bigger picture, putting design decisions in context. It’s been only 21 months since the last post, but both Equalizer and me are still alive. This month we finally released the version 1.0, which was looong overdue. Most notably, this release defines the stable API for all Equalizer 1.x releases. This means that all the functions marked with version 1.0 will be source-code compatible until we’ll release an Equalizer 2.0. Parts of the API are still undefined and unstable, in particular for the also-new Collage network library. However, 99% all of the functions used by the examples are stable. Since the last major version, 0.9, there have been plenty of improvements and new features, e.g., subpixel compounds, reliable multicast for data distribution, runtime mono/stereo switch and many more. A comprehensive list is in the Release Notes. Please check the release notes on the Equalizer website for a comprehensive list of new features, enhancements, optimizations and bug fixes. A paperback book of the Programming and User Guide is available from Lulu.com. We would like to thank all individuals and parties who have contributed to the development of Equalizer 0.9. The upcoming Equalizer release will have another advanced scalability feature: Load-balancing across all resources used for the multi-display system. I hope to have benchmarks of this feature soon. Last Sunday, we’ve passed the fourth anniversary of ‘Project Equalizer’, as it was called back then. The name stuck, although we are way past a project definition. Equalizer has become a feature-rich, generic framework for creating parallel and scalable OpenGL applications. Since last year, the code has matured considerably, and a lot of new exiting features such as load-balancing and DPlex (alternate frame rendering) support. Furthermore, the community has grown a lot and there are a couple of new users out there. Since last year, the Equalizer project and community feels much more ‘serious’, something which can’t be expressed by features alone. The upcoming BOF and activity on the mailing list is a good indicator for this. I am looking forward to another year of interesting tasks around parallel programming and 3D graphics! After months of talk on the eq-dev mailing list, finally we have a stub integration of OpenSceneGraph and Equalizer. Kudos to everybody, especially to Thomas, how was the one which made finally the first step! I’ve started a new pet project: Parallel GLUT, which is a parallel implementation of the GLUT API. The website, much like the source code, is still very minimalistic. Eventually it will grow to support multi-GPU systems and clusters for GLUT programs with minimal changes, and it is based on Equalizer. This project is really born out of curiosity, and I don’t have much time to work on it. So far it can do very little, but I hope that over time it will become useful. How knows, maybe somebody picks it up and extends it to his needs? Let me know what you think in the comments below!